it's not technically fall for another week or so but we're getting excited for our favorite season. these are from a shoot we did this week and i developed the recipes for the article on holiday side dishes. 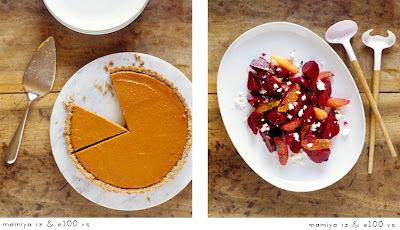 here's the pumpkin tart recipe and i'll share the beet & orange salad recipe soon. hope it gets you in the mood. grease a 9-inch tart pan. grind nuts, flour, flax seeds, sugar and salt in a food processor. add butter and pulse until a coarse meal forms. add egg yolk and pulse until moist clumps form. press dough into bottom and sides of pan about 1/4-inch thick and pierce the bottom with a fork. freeze for 30 minutes. preheat oven to 400 degrees F. bake 12-14 minutes until golden and let cool for 20 minutes. preheat oven to 375 degrees F. whisk together brown sugar, eggs, molasses, vanilla, salt, and spices. whisk in pumpkin and yogurt until combined. pour filling into cooled shell and spread evenly. bake until set, 35-40 minutes. cool completely in pan on a wire rack. great styling and photography - you guys are talented!